Our Phoenix DUI Lawyer offers affordable, expert DUI representation for Phoenix, Maricopa County, Arizona. That is to say, our defense attorneys are knowledgeable and experienced in Arizona and Phoenix DUI law cases. We also represent individuals, families, and businesses in throughout Phoenix and the surrounding communities. No matter if it is the first time you have been in trouble with the law, a simple misdemeanor, or a major felony charge, our Phoenix criminal defense team is ready to protect your freedoms and liberties. An arrest for drunk driving and charged with a DUI can often times have lifelong consequences, and can even potentially ruin a life. In fact, without the best DUI lawyers representing you, you could pay for this unfortunate mistake for a long time. If you or a loved one is arrested for drunk driving and charged with a DUI in Phoenix, it is important to contact an experienced Phoenix DUI attorney for legal guidance. A seasoned defense lawyer can advise you as to what steps you should be taking to ensure the protection of your rights. For this reason, don’t risk a DUI conviction in Phoenix, take advantage of the FREE CASE EVALUATION by an attorney at My AZ Lawyers — our Phoenix DUI Lawyer and staff will listen to your case, discuss with you your options, and build a strong defense for your particular situation. Our experienced attorneys and staff will work aggressively to review your case and prepare a defense in order to either get your DUI charge dismissed, or to get you the best possible desired outcome. 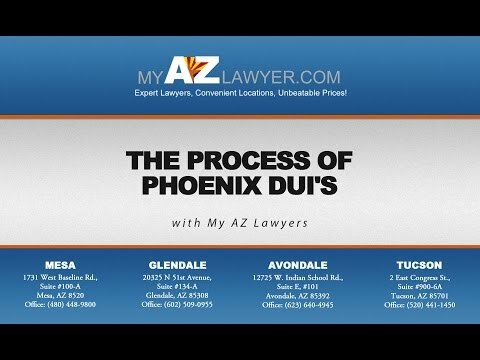 If you have been arrested for DUI in Arizona, and If you are unfamiliar with the Arizona DUI law, call our Phoenix DUI Lawyer. Don’t let a Phoenix DUI ruin your life, your reputation, your family, or your finances. You may have questions about your Phoenix DUI arrest, the DUI process, DUI paperwork, or court proceedings. Let the attorneys at My AZ lawyers assist you at your convenience. In order to determine an assertive and reasonable DUI defense, we will examine every aspect of your case and scrutinize the relative factors and evidence in your case. Despite your DUI arrest, you still have rights; however, you need to contact My AZ Lawyers and consult with a knowledgeable Arizona DUI law attorney in order to protect those rights. Also, the law is complex and can be confusing, so allow the experts to focus on the details of your case and build you a strong defense. Don’t hesitate after a DUI arrest to contact My AZ Lawyers. One of our Phoenix DUI lawyers are easily accessible and available to speak with you about this serious charge. You will be able to make good decisions about the DUI charge after you consult with an experienced Phoenix DUI attorney. A free consultation with our Phoenix DUI lawyers will give you better clarity and you will better understand your how to handle your situation as we prepare your criminal defense. By all means, call our Phoenix DUI Lawyer for a FREE CASE EVALUATION with a My AZ Lawyer attorney. Robert Curigliano, Anthony Ramirez, Lisa Monnette ^^ Trusted Criminal Defense and DUI attorneys in Phoenix. Let our Phoenix DUI lawyer fight for you, whether you are facing a first time DUI or a more serious DUI offense, you need an experienced defense lawyer fighting on your side. Contact us today to schedule a free consultation. Our best Phoenix DUI attorneys will review your DUI case to determine the best defenses for your case. Our lawyers will study the facts of your case and find the best solution, rather than finding a quick fix. In addition, our Phoenix DUI Attorneys will search for the most cost effective solution. Also, we will find a solution that can benefit you the most in the long-run. Why should you expect anything less than the best solution from your lawyer; especially, when your freedom and reputation is on the line? Don’t hesitate after a DUI arrest to contact My AZ Lawyers. Time is of the essence. One of our Phoenix DUI lawyers are easily accessible and available to speak with you about this serious charge. You will be able to make good decisions about the DUI charge after you consult with an experienced Phoenix DUI attorney. We will aggressively fight for you, however, being aggressive also requires being proactive on the part of someone arrested. Take initiative over your DUI charges by contacting our attorneys directly and letting us help fight for you. Lastly, a free consultation with our Phoenix DUI lawyers will give you better clarity. You will better understand how to handle your situation as we prepare your criminal defense. 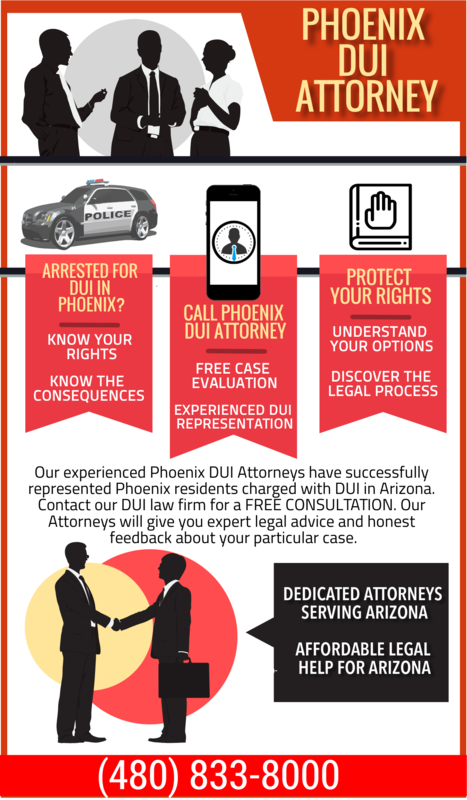 Call our Phoenix DUI Lawyer for a FREE CASE EVALUATION with one of our experienced Phoenix defense lawyers.